The 4th Congress of the European Academy of Neurology (EAN) takes place in Lisbon, Portugal from June 16-19, 2018. The overarching theme for the Lisbon conference will be ‘Neurogenetics’. Diagnosis and treatment are increasingly using genetic methods and one purpose of the congress is to highlight clinically useful aspects of genetic medicine in Neurology. But as always, progress in all fields of neurology will be presented and participants will be updated about recent developments and news in clinical neurology. The full congress programme can be viewed HERE. EBC will be present at the Exhibition Hall for the duration of the Congress (16-19 June) – visit us at Booth C35 to learn more about our latest work, pick up a copy of the Brain Mission, VoT White Paper or Annual Report 2017! Stop by the Scientific Theatre on Sunday, 17 June for the EAN-EFNA presentation “Mind the Treatment Gap!” at 12:00 with EBC Vice-President Prof. Wolfgang Oertel and EBC Treasurer Joke Jaarsma and the EBC presentation “The Value of Treatment: Improved patient journey in neurology” at 14:00 with Joke Jaarsma and Prof. Maura Pugliatti. View full schedule here. 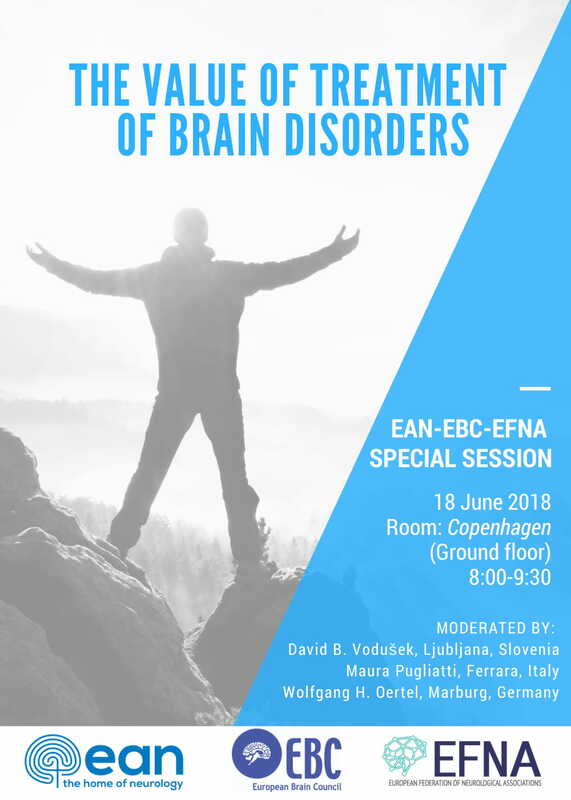 EBC will also hold a Special Session together with EAN and EFNA on The Value of Treatment (VoT) of brain disorders on 18 June 2018 at 8:00-9:30 (Lisbon time).